Vegan or not good pastry is good pastry. As you read in my last post, I created a tart shell that is as perfect as one loaded with dairy. Today I will show you what to put in that shell as a perfect compliment. For me it seems every time I add fig leaves in a dessert it leaves people in awe, most people don’t work with figs or know how to use them. They have a slight coconut flavor that I believe balances out the almost off flavor off canned coconut. 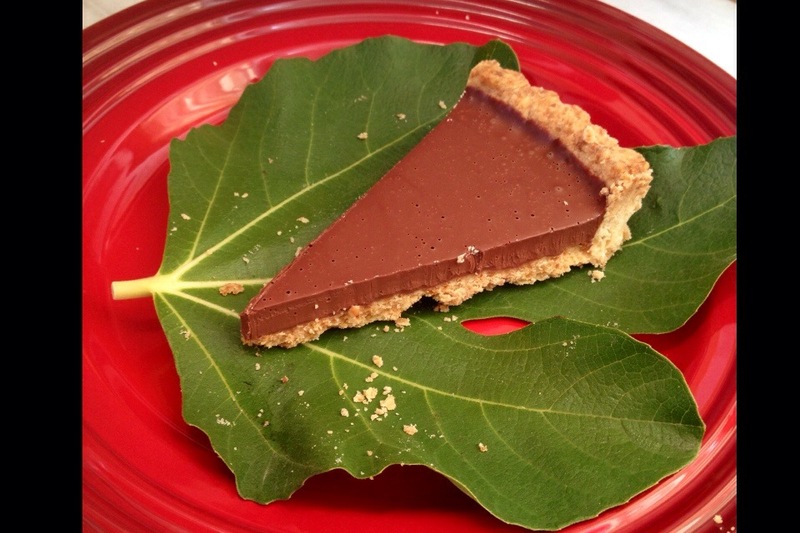 To accomplish this tart is easy as long as you have a few simple tools in your kitchen. 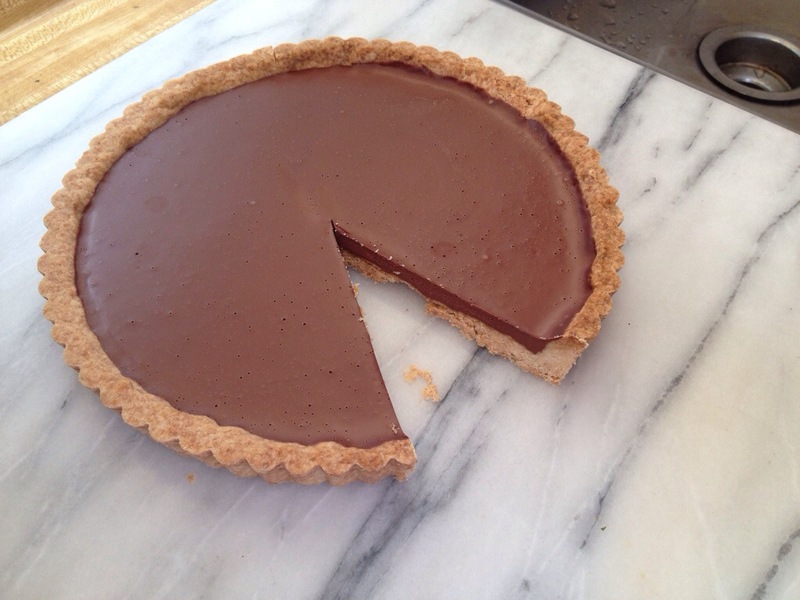 This is a no bake ganache tart so serve it chilled or pull it out 10 min before you serve it to spare your guests chilled teeth. 1. Make a chiffonade cut by rolling up your fig leaves and then slicing. Make sure to take off the bottom stem before you slice. 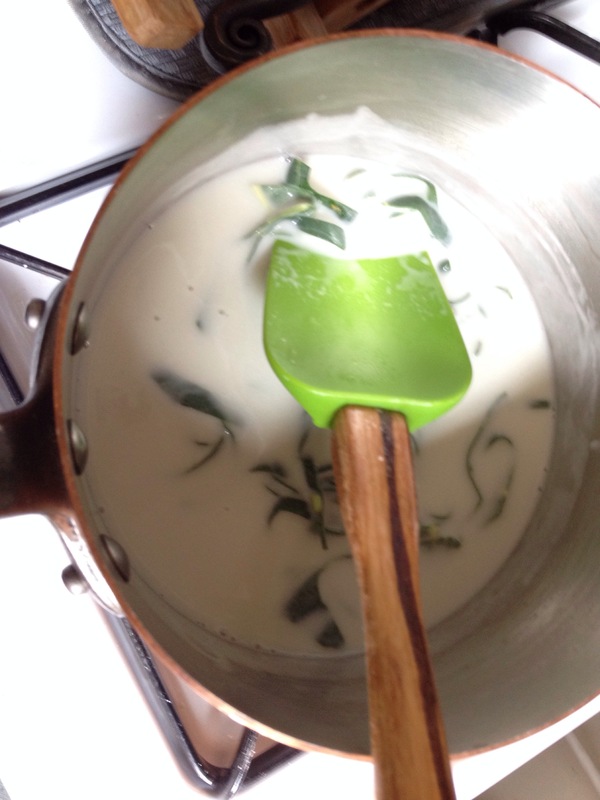 Place the fig leaf bits into a small pan and plour the coconut milk over them. Bring your mixture to a scalding, just under a boil and then let your leaves steep for 3-5 min or until you like the balance of flavor. 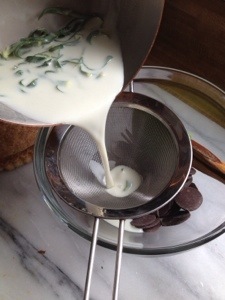 If you aren’t using fig leaves pour the hot milk over the chocolate wafers. 2. 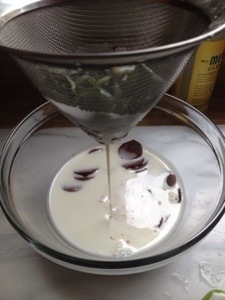 If using fig leaves after 3-5 minute strain the milk from the leaves over the wafers. 3. Place back over a small pan with about and inch of water in it to create a double broiler. Place the chocolate back over and turn the heat to medium. Let sit for a couple minutes to heat the milk and then whisk together. Add a pinch of salt and pour into the prebaked tart shell after well combined. 4. Place in the fridge for 2-3 hours until set! Enjoy with your neighbors, both vegan and dairy centric! I must admit my current job is taking a lot out of me, I have barely cooked or baked at home for the last month which is terrible as my kitchen is where my muse lies. I sense a new chapter coming in my life, one where I do a little bit of summer cleaning and get back to learning simple rustic desserts. The chez panisse crew and I are heading into the tcho chocolate factory tomorrow to have a private tour. Tcho is a company based in sf that states clearly on their packaging “no slavery”. Most of the chocolate in our country is produced by slaves and it is why most chocolate bars cost $1. Sometimes as vegans we get so caught up in animal rights that we forget we are animals too, and there are plenty of animals out there…humans that are slaves too. I first learned of this when my brother was in the theater program at his high school. Every fall they made each theatre student sell a box of sees candy chocolate bars to help support the theatre program. When he tried to sell one to a guy he respected at school he responded by saying he didn’t eat chocolate picked by slaves. My brother was freaked and when he went home he researched in depth to find out that it was in fact true, that majority of chocolate in the US is picked by child slave labor….let me repeat that… child slave labor. Being twelve I still understood this was wrong and cut unfairly traded chocolate from my diet. Today we have many options in this country to choose from, and I urge those of you who care about animals to take the same care with humans! There are many resources online if you google fair trade chocolate, and a lot will deliver in the cooler months of the year! 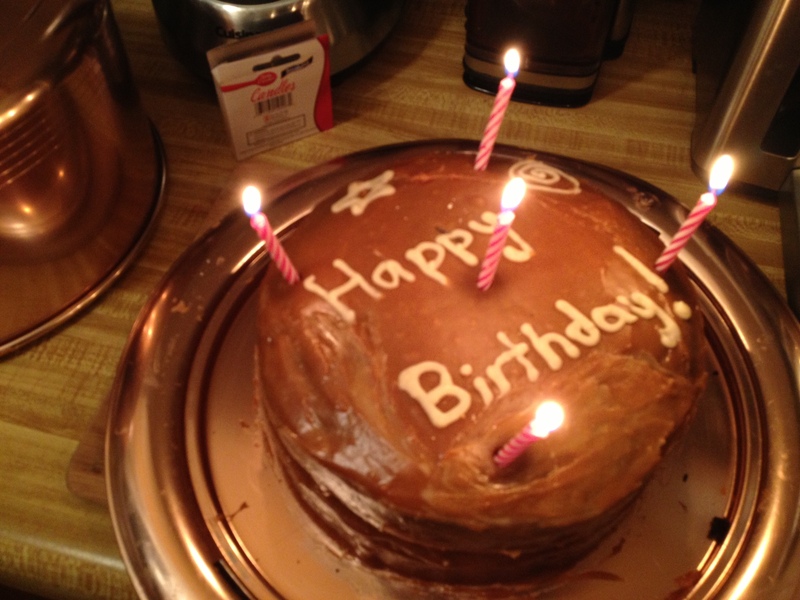 To celebrate fair trade chocolate this is a recipe I made for my brother on his birthday this year. Not the best cake design but definitely a delicious vegan fair trade chocolate cake! I am sorry for the poor picture quality on this post, I had no idea I was going to share this with the world. This recipe is adapted from Isa Chandra’s chocolate cake recipe. 2.Mix the milk and vinegar in a bowl to curdle in a large bowl. Meanwhile sift all your dry ingredients into another bowl. Then add the sugar, oil, vanilla, and almond to the wet ingredients and mix until well incorporated. Add the dry ingredients in 3 batches making sure each addition is well incorporated before adding more. 3.”Butter” an 8 inch spring form pan lightly and pour the mixture into the pan. I personally also like to cut out a 8 inch round parchment to lay over the bottom after I greased it for easier removal from the spring form. 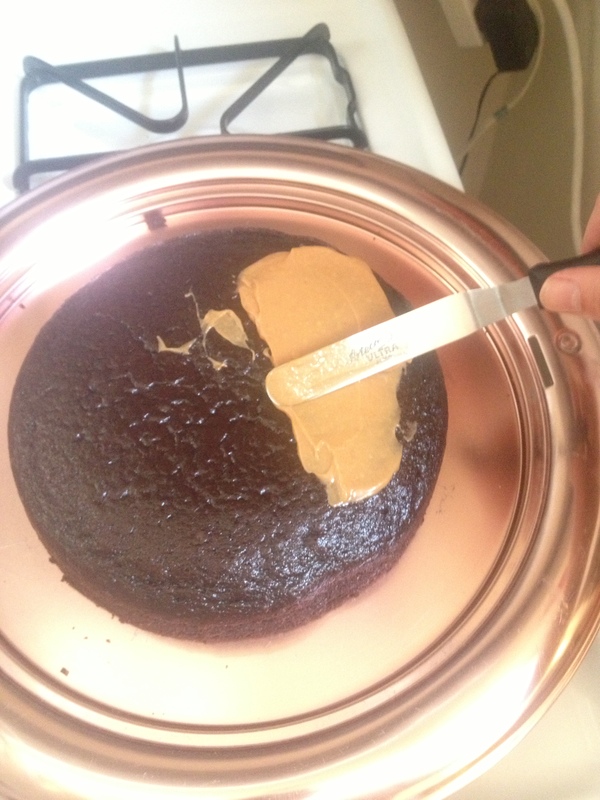 Bake for 30-35 minutes or until a toothpick inserted in the center comes out clean. If you want a layered cake. Cut the cake in half before you frost! 4. While the cake is baking make the frosting. Using a hand mixer mix together the powdered sugar and peanut butter. Add a little at a time of the almond milk until the mixture comes together and is a smooth and spreadable frosting. Be careful not to add too much milk as the mixture will become to runny, too little and you will break the cake when you try to frost it. Remember to let the cake cool completely before frosting or you might be giving your loved one a big mess of a cake! My parents visited me and my boyfriend in Oakland a couple weeks ago and brought me a bag full of lemons from their tree in LA. They gave me a couple days notice so I would have time to prepare mentally for the onslaught of lemons that was about to enter my kitchen. First I made lemonade, and true to my grandmother I used her simple and easy ratio! It honestly makes the best lemonade with a perfect balance of sweetness and acidity. Mix all ingredients together and then refrigerate. I next went about creating candied lemon peels like I made at work before Chez Panisse caught on fire. It is an interesting process of blanching and boiling in simple syrup which I will post as soon as I get the whole thing down to a science myself! But even after all these recipes and uses I still had tons of lemons in my house which were quickly going bad… and then I remembered a childhood favorite. 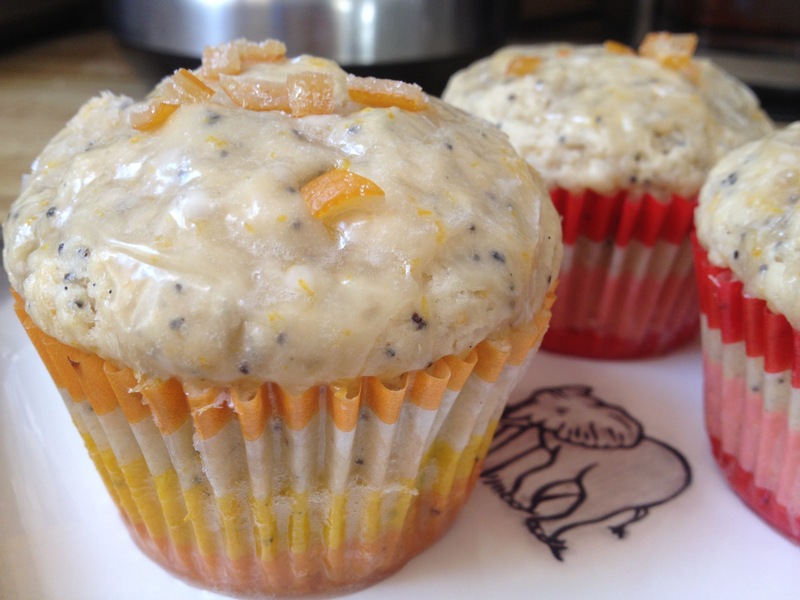 Lemon Poppy Seed Muffins. This recipe is adapted from the goddess herself, Isa Chandra. 2. Combine all dry ingredients, taking care to sift the flour for maximum fluffiness. 3. Combine all wet ingredients. 4. Create a well and pour the wet ingredients with a fork into the dry ingredients until well combined taking care not to over mix. 5. Once combined use a spoon or ice cream scoop to fill each lined muffin mold in your pan. 6. Place in oven and bake for 23-27 min or until a toothpick inserted into the center comes out clean. 7. Place on a rack to cool and after they have cooled slightly spoon the glaze on top. Garnish as you like, I used chopped candied lemon peel but feel free to leave as is. 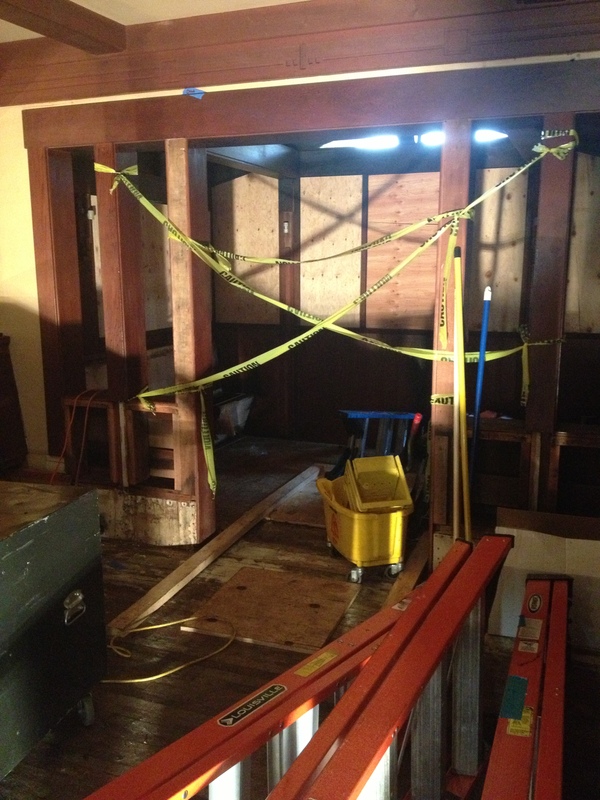 Chez Panisse is closed, at least until April 1st, but probably longer. 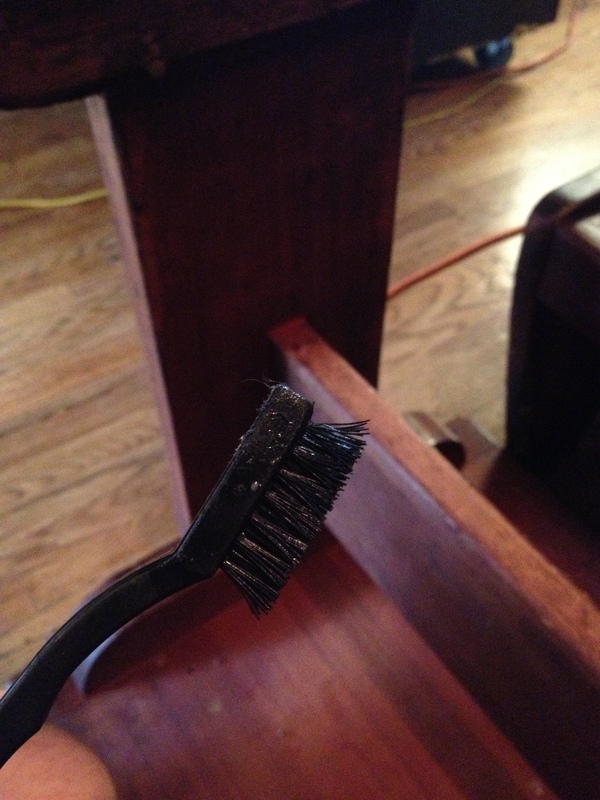 There was an all staff meeting this week where we discussed the cleaning that needed to be done etc. The city of Berkeley said they would turn around permits in no time and approve a new design for the facade. I am part of the clean up crew, and I found myself handed a toothbrush and some non toxic cleaner to scrub the corners of the room. It was nice to see everyone in normal clothes, and to talk to people who normally are working upstairs or waiting tables. The family gets stronger when events like the fire happen, and I am grateful to be apart of such a weird and wonderful family. 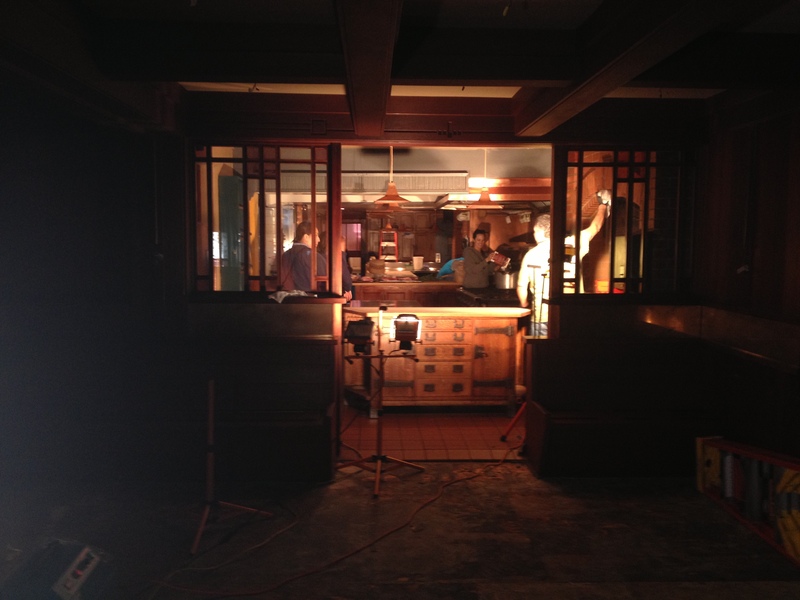 I will keep you all posted on the comings of Chez, but in the meantime here are some interior photos. I love burgers, who doesn’t? It seems to be ingrained in our American consciousness. I do miss the days of in-n-out burgers, even the grilled cheese is incredible in its own right! Sometimes I just crave a burger. 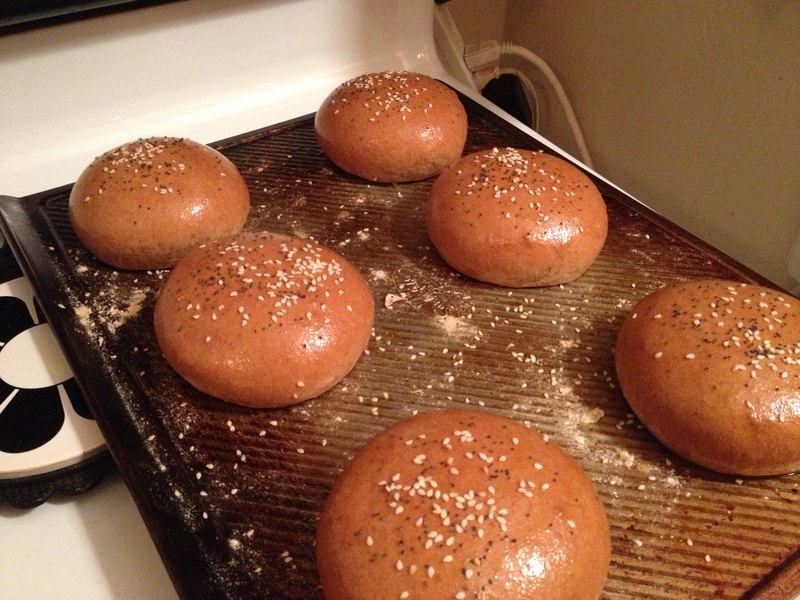 I must admit I have never made hamburger buns before, I always had Brendon run to the store when I was creating a beet burger, cauliflower burger, etc. Today I was determined to create a burger bun without dairy or egg and eat it too! This recipe I adapted from Holy Cow one of the best vegan blogs in this world. Check it out her writing and recipes are ones that generations of new plant eaters will crave. 1. Combine a half cup of warmed water with the active dry yeast and sugar. Stir and then let sit for 10-15 min or until the top begins to foam. If this reaction doesn’t happen your yeast is dead so either don’t continue or run to the store! 2. Meanwhile sift the flours, vital wheat gluten, and baking soda into the bowl of a food processor fitted with the dough blade. Pulse a few times to incorporate the ingredients together. When the yeast is activated dump it into the bowl along with the vegetable oil and turn on the food processor. Through the top tube pour in the rest of the water till it becomes a homogenous ball of dough that has picked up the rest of the dough from the sides of the bowl. The sides of the bowl should be cleaned by the dough ball and should not be a sticky wet mess. If this is the case add a quarter cup of flour. You may need to add a bit more flour or water depending on the dough. The ball should be sticky but should not readily stick to your hands. 3. Fold dough into a rough ball and set into a bowl and cover with plastic wrap or a kitchen towel. Let this rise for 2 hours, or put it in the fridge and let it rise for 4 or more hours. 4. After 2 hours punch the dough down and separate into 6 equal size pieces, a scale works great, and that way you can make sure they are cooking evenly! Shape the equal size pieces into buns by folding the dough down underneath itself. Then place each piece on a pre floured baking sheet several inches apart pressing with your fingers to flatten the tops of the rolls slightly. Cover with a floured towel and let rise for 1 hour. Preheat the oven to 370 degrees fahrenheit. 5. After an hour place them in the oven creating steam. Then set a timer for 22-25 minutes. Take them out and brush them with olive oil sprinkling with sesame seeds and poppy seeds and then let them cool on a wire rack. In other news, my dear friend alice of Smokin’ Tofu has been nominated for UK VegFests awards for best blogger so check her website out and vote! Congrats Alice! I must admit I am a wake and baker, though not of the pot smoking kind. 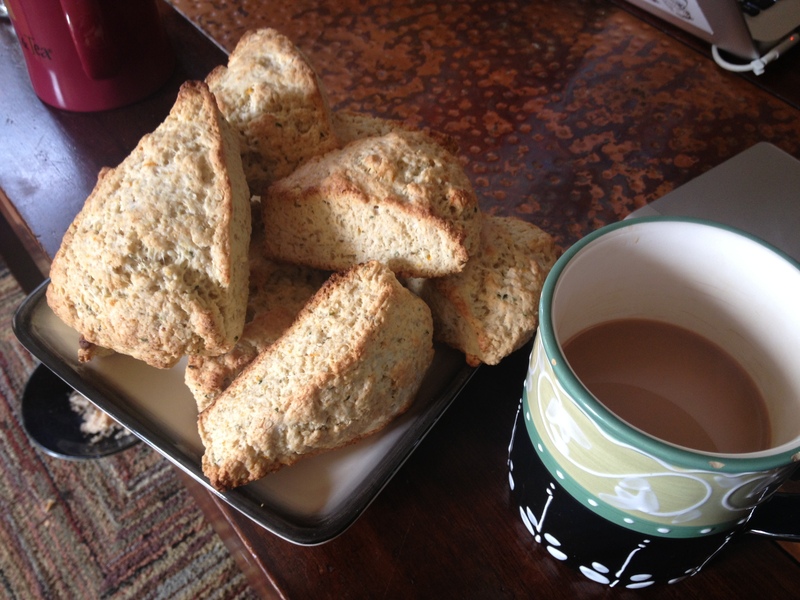 I think scones are the best thing to wake up to in the morning, especially with a cuppa. My boyfriend is always thinking up new and crazy combinations to put together and last night he suggested hemp seeds in my coconut milk scones. WHY NOT? Hemp seeds are incredible, they have an equal balance of Omega 3 and 6 fatty acids for humans. They are a complete protein having all essential amino acids, have tons of magnesium, zinc, iron, and potassium…aren’t convinced yet? 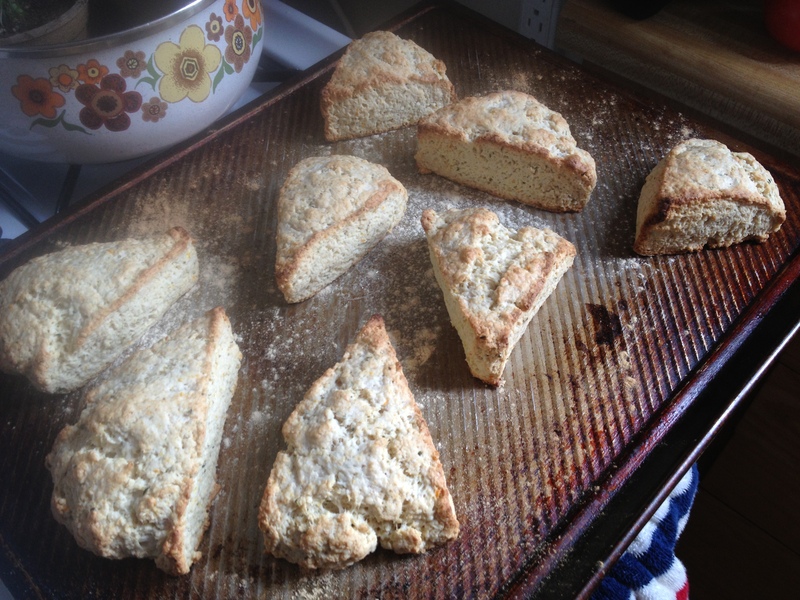 Just try these scones! 1. Preheat oven to gas mark 425 Fahrenheit. Sift flour and baking powder into a bowl and then add the rest of the dry ingredients including the help seed. Add in the rest of the ingredients pouring slowly until coconut milk is combined. 2. On a floured workspace take the dough out of the bowl and flatten into a 9 inch round. Cut the round into 8-12 pieces depending on the size you like. Place on a baking sheet and lightly coat with more coconut milk and a dash of raw cane sugar. 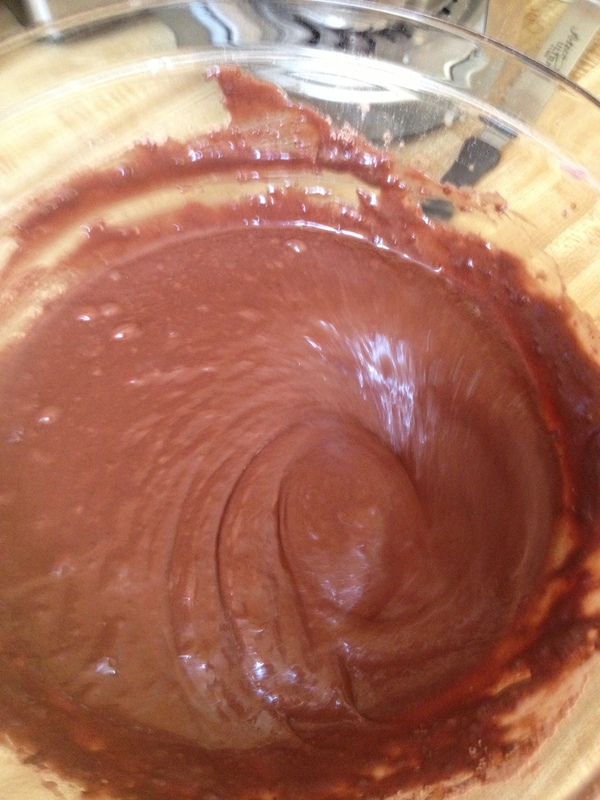 Place in the oven for 15-20 min or until outside feels hard and the edges begin to brown! 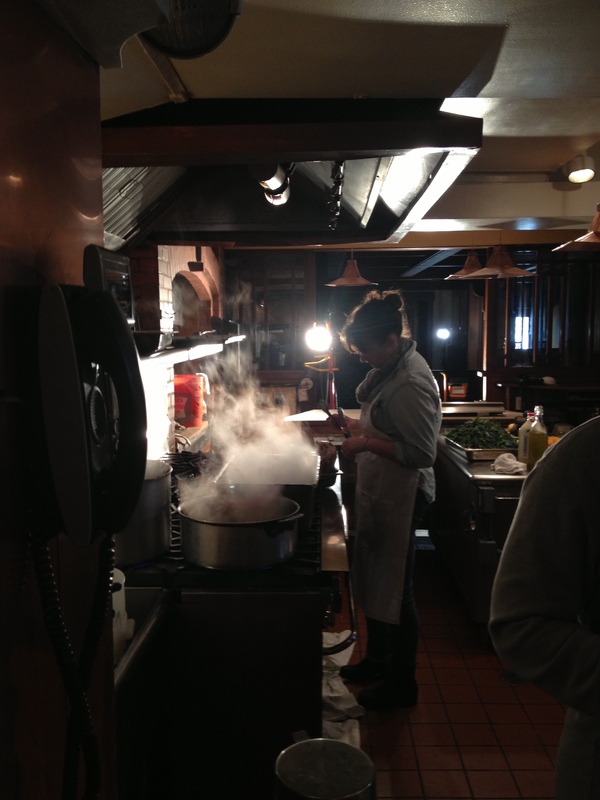 Yesterday I had my first night shift at Chez Panisse. I am more of an evening person so the 3-10 pm works better for me than waking up at 5:30 in the morning! The day is largely different in that instead of getting there earlier than everybody and setting the stations up, you stroll in with everything prepared and hide away in a little nook. I started the day by meeting with the head pastry chef Carrie. She has a grace and an ability to communicate in an instructive way without being condescending. I can only hope that if I get the opportunity to be a head chef someday that I will be as composed and instructive as she has been in my short stint at Chez Panisse. At 4 pm it is crazy in the kitchen, though this is not to be mistaken with messy or chaotic. 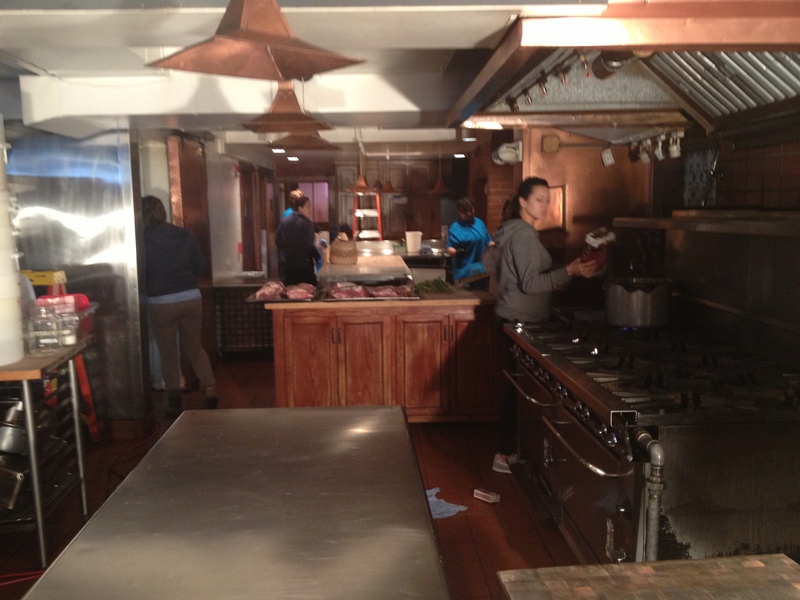 Several different crews are in the kitchen working on different services (staff meal, cafe, and restaurant). 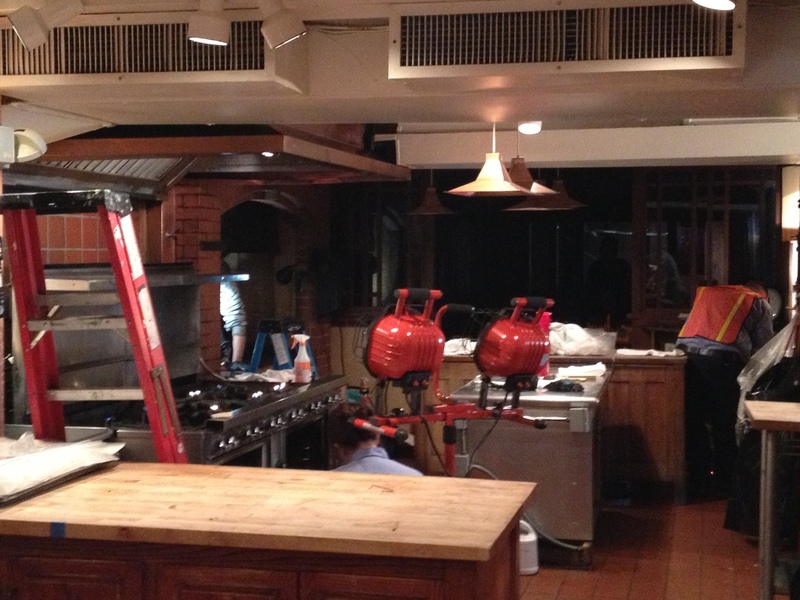 It is transition time, and in an hour the kitchen will be cleared, clean, and ready for dinner service. I love pastry, I love how intense the staff is, how focused we all are on counting through leaves etc. I work well alone, and flourish in a setting that lets me focus on my own task. But I also love being around people, meeting and exchanging ideas and learning about others. Today I looked out the window of the room I was working with and saw all of the savory interns and cooks from the previous shift outside having their shift drink together. I admit it looked nice as we only have one pastry intern on during a shift and I feel I don’t have any contemporaries to talk to, well except for Erica, though she has already left for Los Angeles. Another perk to the night shift at Chez Panisse is that we get to have one of every dish on the menu, essentially the dinner people are paying up to $100 a person. Every dish was better than the previous tantalizing my taste buds with delicious flavors I have never experienced before. I can feel my pallet adjusting to new flavors and foods. At about 7pm Alice Waters came through the back doors of the restaurant and I tried to hide being a little star struck. She has such a presence and warmth along with knowledge and passion. I am looking forward to the first time I get formally introduced as she is an idol to all those who believe in the slow food movement she nourished and calls today “a delicious revolution”. At the end of the day I went upstairs to get my shift glass of red wine and enjoyed it on the back patio while reflecting on my day. What a beautiful life I have I thought feeling the beautiful surrounding and the moderate night enveloping me. What a beautiful life. 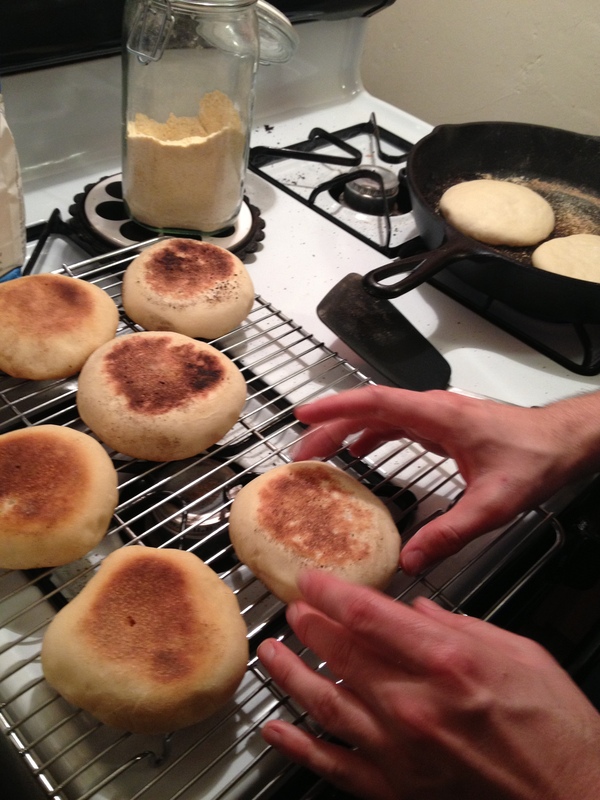 My boyfriend LOVES English Muffins. We don’t buy bread stuffs in my house, but Brendon always sneaks English Muffins in the door. Now not that anything is wrong with store bought muffins (he buys whole wheat and simple ingredients) but I felt that homemade ones would be better! So I set about making my first batch of them, and what a delight they were! 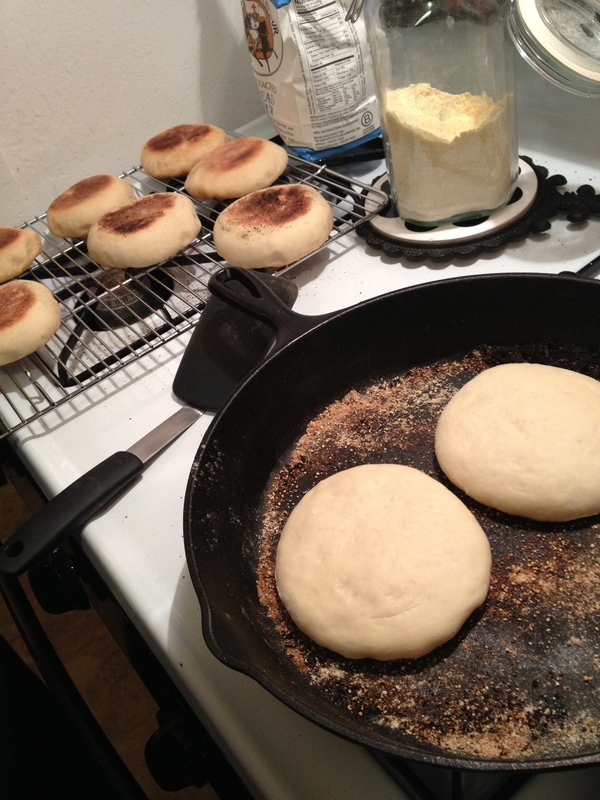 The difference between English Muffins and your typical breads is that they are pan baked verses oven baked. They are in many ways easier to make than bread but the final conclusion has a bit more work involved than just sticking the bread in the oven. For this recipe you will need very basic bread ingredients and then a nice iron skillet to finish these delectable muffins off! Making them made me realize why they have a brown spot on the bottom and top! DUH! It made me realize how disconnected even I am from the food that we take for granted on a daily basis. So clean off the dust from your iron skillet you got as a wedding gift or from your local thrift store and get to making these muffins! I adapted this recipe from Mark Bittman’s How To Cook Everything Vegetarian. 1. Pour your yeast into a measuring cup and add 1/3 cup milk alternative warmed to 110 degrees Fahrenheit. Let sit for 15 min, after that time there should be bubbles to signify that your yeast has been activated. If not do not continue on, try again and if it doesn’t bubble get new yeast! 2. Meanwhile add the flour and sugar to a food processor, it works best if you sift these ingredients first. Then pulse a few times to incorporate the ingredients. Measure out and warm the milk alternative, oil, and salt in separate containers. 3. After the yeast has been activated add it to the food processor and then turn it on. Add the oil, and then pouring slowly add the milk in through the feeding tube. You are done adding the milk once it forms into a ball which should not be too sticky. Once the ball has formed turn the food processor off and shape the dough into a rough ball adding it to a well oiled boil. Cover with plastic wrap or a kitchen towel and let rise for 2 hours. 4. After two hours has passed or the dough is twice its original size, punch the dough down and take it out of the bowl. 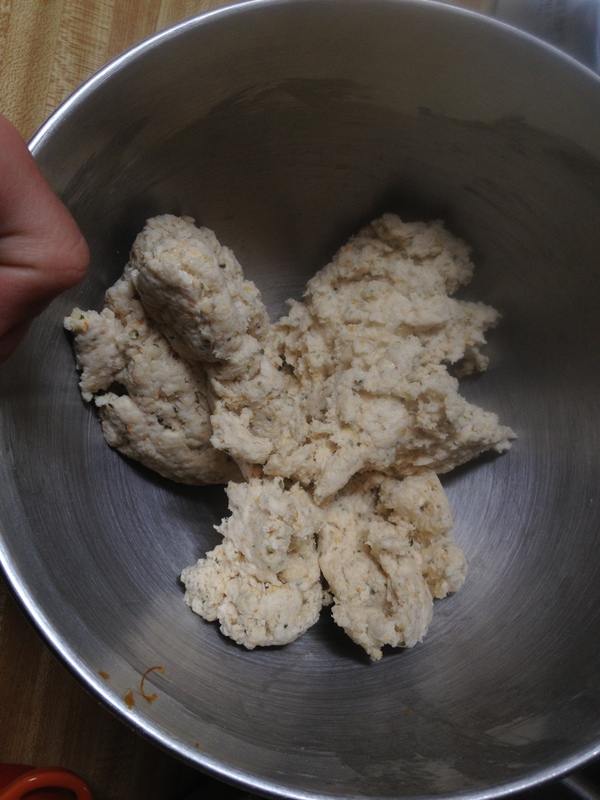 One a well floured surface add the dough and cut into 12 equal size pieces. Shape the dough into 3-4 inch circular pieces making sure that the bottom is sealed. Place on a sheet with a floured towel to cover and let rise for 45 minutes or until they are fluffy. 5. Preheat a large iron skillet over low heat for 10 minutes before your dough pieces are ready. DO NOT OIL IT! When ready sprinkle lightly with cornmeal and add 2-3 pieces of dough. Pan-bake the muffins turning occasionally for a total of about 15 minutes. Remove to a wire rack and start with the next batch. After another amazing dinner with friends I tired away in the kitchen wiping through dirt and grime to find peace and serenity in the kitchen once again. After not being able to fall asleep, I decided it was the perfect moment to catch up and tell you all about my trip with Brendon to the midwest. Yes, Brendon and I hit Chicago and Minnesota stopping in Wisconsin to see some friends of mine. On the first Friday in December Brendon and I took to the air on Virgin America, after that flight I will never be able to look at another airline again. Brendon and I had the whole row to ourselves, which was perfect for sleeping on the early morning flight. We landed in Chicago around noon and decided to find grub, so what in the way of vegan fare does Chicago have…a bounty in fact of delicious fresh food from the midwest. We started off at Xoco, I was a little nervous going to Mexican food but Rick Bayless is well known and I am always down to taste new food. I was not disappointed, the people asked me if I wanted a beer while I waited in line to order at this cafe style eat-in restaurant. The food was delicious overall, but the one thing that threw the food off was the intensity of sodium in every bite. My mushroom salad still was incredible, and their salsas were delicious too, I guess you do not have to be in California to enjoy a bit of Mexico. Here’s the menu! After a long day of travel we ended up at the boys town bars in Chicago. Is it just me, or is it weird that you can’t dance at the gay bars in Chicago?! We left the next morning for Minnesota but not before enjoying some of the best vegan diner food in the country. The Chicago Diner is a gem, all of the items on their menu can be adapted vegan, and to my surprise it was not a strictly vegan destination. Omnivores flock to the diner for delicious plant based grub, some surprised by the delicious vegan fare. Oh, and you can’t forget the vegan fairtrade milkshakes!